Global telecom companies competing in the fast-paced, continually evolving world of mobile technology require ongoing business transformation to stay on top. Seventy-five percent of the world’s leading telecoms turn to Subex Limited, a longtime leader in the evolution of mobile technology, for business assurance consulting. 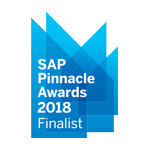 Together with their partner Blueprint Technologies, they use SAP SuccessFactors solutions to provide end-to-end ERP for a wide range of industries.